Fresh Threats From Pyongyang As Joint Military Exercise Begins : Parallels The annual drill between U.S. and South Korean troops comes in the wake of a bitter back-and-forth between North Korea and President Trump. South Korean soldiers participate in an anti-terror and anti-chemical terror exercise Ulchi Freedom Guardian exercise last year. North Korea is issuing fresh threats against the United States as a 10-day computer-based military exercise gets under way on the Korean peninsula. It's an annual joint drill between American and South Korean forces, but this year, it comes following a bitter back-and-forth between North Korea and U.S. President Donald Trump. Joint exercises happen twice a year — once in March, again in August. The U.S. has always maintained these are purely defensive and to keep the two militaries prepared in case of an unplanned event like a missile strike. North Korea, however, has long viewed the exercises as rehearsals for invasion. Its top propaganda paper, the Rodong Sinmun, on Sunday wrote the exercise is "the most explicit expression of hostility against" North Korea, would be like "pouring gasoline on fire" and worsen the state of the peninsula. 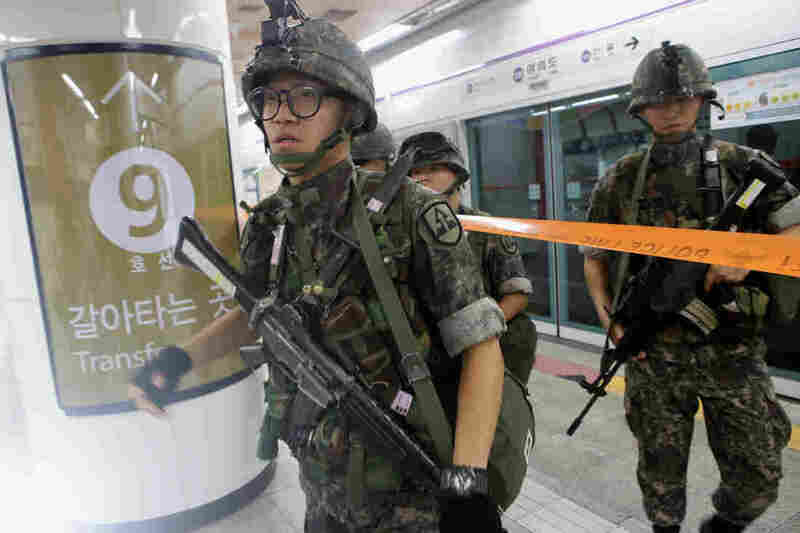 "The Korean People's Army is keeping a high alert, fully ready to contain the enemies. It will take resolute steps the moment even a slight sign of the preventive war is spotted," it said. After North Korea's ICBM Launch, Now What? The August exercise — called Ulchi Freedom Guardian, or UFG — is a computer based simulation for unplanned events that include military actions but also terror or chemical attacks. This year, 17,500 members of the U.S. military and nearly 50,000 servicemembers from the South Korean military are taking part. Unlike the March exercise, UFG doesn't include live fire drills and happens concurrently with drills by local governments and civil servants to prepare South Korea's civil defenses. While there is nothing inherently new about what's happening this year — the exercise has gone on since the mid-1970s — what's different is the context. It comes on the heels of North Korea testing two intercontinental ballistic missiles in July, and an announcement that it was examining a plan to possibly bracket Guam with missiles — a plan that is on hold. And, the tensions were ratcheted up further when President Donald Trump made threats of fire and fury to North Korea. This year, the U.S. has scaled back the number of troops participating by about eight thousand, but Defense Secretary James Mattis says that's not because of heightened tensions. He told reporters fewer troops were needed because of integrating some roles and emphasizing command post operations. But, because of the increased attention on the Korean peninsula, North Korea's allies of China and Russia are making louder calls to freeze these exercises in the interest of getting North Korea back to the table to talk about de-escalating aggression on the peninsula. China and Russia back an idea known in shorthand as "freeze for freeze" — suggesting that the U.S. and South Korea should suspend its large scale annual exercises in exchange for Pyongyang halting its nuclear and missile tests. So far the U.S. and South Korea have rejected this idea. "As long as the threat from North Korea exists, we need to maintain a high state of readiness to respond to that threat," Dunford told reporters in Beijing last week. He said the military exercises are "not currently on the table as part of the negotiations in any way." Jihye Lee contributed to this post.